Murtaugh: This was a new car, Riggs. One gets the immediate impression that this sequel is going to be much more lighthearted than the original Lethal Weapon from the very opening, as the soundtrack begins with the famous Looney Tunes sproing and the opening phrase from The Merry-Go-Round Broke Down. Its status as an action comedy is cemented by that theme's evolution into screaming sirens and screeching tires as the cop team of family man Roger Murtaugh (Danny Glover) and suicidal maniac Martin Riggs (Mel Gibson) surge back into action in a wild car chase (one of many in the picture). The cut provided here is the original theatrical edition rather than the slightly longer director's cut previously released on DVD (though there are several deleted scenes included on this disc). Riggs and Murtaugh have settled into something of a routine, with Roger accepting Martin's madness even though it gets them into grave danger and causes plenty of property damage. The opening car chase leads to the discovery of a trunk full of Krugerrands and a bunch of South Africans led by Arjen Rudd (Joss Ackland) who are obviously up to no good, but are sheltered by diplomatic immunity. Taken off that case after the South Africans give a none-too-subtle warning by invading Murtaugh's home, the team is assigned to guard motormouthed accountant Leo Getz (Joe Pesci), who is turning state's evidence in a money laundering scheme. But when those same South Africans try to kill Leo, Riggs and Murtaugh start to connect the dots. The story is fairly straightforward, though it dovetails the various plot threads quite nicely. Having set up the character and the general situtation in the first entry, this sequel doesn't bother doing an iota of exposition, but instead just forges into the humor and the action. The comedy doesn't have the dark edge of the original, since Riggs isn't quite as suicidal in this picture. He even gets to develop a love interest with the secretary of the South African consulate, Rika van den Haas (waifish Patsy Kensit). But that doesn't mean he's any less out of control, just that the danger tends to come in the nature of crazed recklessness rather than black suicidal notions. One gets the sense half the time that he's enjoying his reputation and putting people on as to exactly how crazy he might be; certainly he puts that unpredictability to good use in several of his confrontations with Rudd. South Africans in the late 1980s were pretty handy villains, since they could substitute as modern-day Nazis with little compunction in the days when apartheid was still the law there. Now that the country has been fairly rehabilitated in public opinion the cartoonish evil reminds one of portrayals of Germans and Japanese villains during World War II. It all feels a little embarrassingly over-the-top today, though at the time the treatment felt richly deserved. The picture's kill-the-bad-guys ethos basically does for diplomatic immunity what Dirty Harry did for the Fourth Amendment. Gibson delights in doing comedy, and he takes the part of Riggs here and runs with it, turning the character in one part Stooge, one part Looney Tune and one part Jonathan Winters gone amok. At the same time, he and Glover evolve into the ultimate buddy-cop team here, with perfect comic timing and an obviously deep affection between their characters. They bicker like an old married couple, but when an outsider, such as Getz, intervenes, they unite and speak as one more than once. Pesci's Getz is memorable and hilarious, while being completely annoying. Unfortunately, he'd become too much a focus of the next picture in the set. The action sequences are vibrant and adrenaline-packed and the blend with the comedy is highly enjoyable. 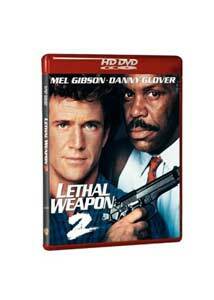 Easily the best of the series, Lethal Weapon 2 is nonstop fun. Image Transfer Review: This, like the original Lethal Weapon, doesn't have the best translation to HD DVD. It seems very soft throughout, and the end titles display a great deal of aliasing and jagged edges that shouldn't be there in a proper transfer. Detail is generally lacking, though in brightly lit outdoor scenes it's quite acceptable. In a few scenes, edge enhancement crops up, compounding the problems. Color and black levels are good as one typically expects in HD DVD. On a couple occasions judder is prominent on panning shots. This will need to be revisited, I'm afraid, although the source print is in excellent condition. Audio Transfer Review: There are no problems, on the other hand, with the audio. During the action sequences there's plenty of movement in the mix and the surrounds come alive. Quieter scenes have virtually no noise or hiss. Dialogue is generally clear, though on occasion one needs to check the subtitles to follow Pesci's rapid-fire delivery. Explosions and gunfire all have good bass impact and range. The music score sounds fine, though the sax doesn't have the best presence. Extras Review: The extras are fairly limited (and none are presented in HD). A short featurette on the stunts and action sequences (3m:43s) includes a little behind-the-scenes footage of one car chase. A set of three deleted scenes runs 3m:56s. The small package is wrapped up with an anamorphic widescreen trailer that emphasizes the comedy aspects of the picture. One of the most enjoyable action comedies ever made, the HD DVD of Lethal Weapon 2 disappoints somewhat in the video transfer and extras departments.